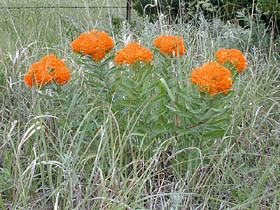 Also Called: Butterfly weed, pleurisy root. Stems: Erect or ascending, stout, simple or sparingly branched above, very leafy, long-hairy; sap watery. Leaves: Alternate, simple, short-stalked, numerous, crowded, oblong-lanceolate to linear-lanceolate, 2-4 inches long, 1/4 to 1 inch wide, shiny green and nearly glabrous above, velvety-hairy below; margins entire; tips pointed to rounded. Inflorescences: Umbels, 1 to several, short-stalked or sessile, 6-25-flowered, terminal and in upper leaf axils. Flowers: 5-parted, about 1/2 inch tall; calyx lobes linear to lanceolate, green to purple-tinged; corolla lobes orange to red or yellow, bent downward; hoods erect; horns slender, needle-shaped; all similarly colored. Fruits: Pods, spindle-shaped, 3-6 inches long, about 1/2 inch wide, nearly erect on downward-curved stalks, finely pubescent; seeds numerous, broadly oval, tufted with white hairs at tips. Habitat: Dry, sandy or rocky soils of prairies, roadsides, and waste places. Uses: Native Americans and pioneers used the roots to treat respiratory problems, which is how the common name "pleurisy root" originated. Comments: The flowers of this plant attract butterflies and many other insects. Butterfly milkweed has a deep taproot, so it does not transplant easily. It will readily grow from seed. Formerly treated as Asclepiadaceae - Milkweed Family.